This 48 OE looks like the strong, stable fishing platform it proved to be. The Freelance’s open targa top style is unusual in New Zealand. It is so versatile – the bridge can be opened up completely on hot days offshore, or closed up for protection. 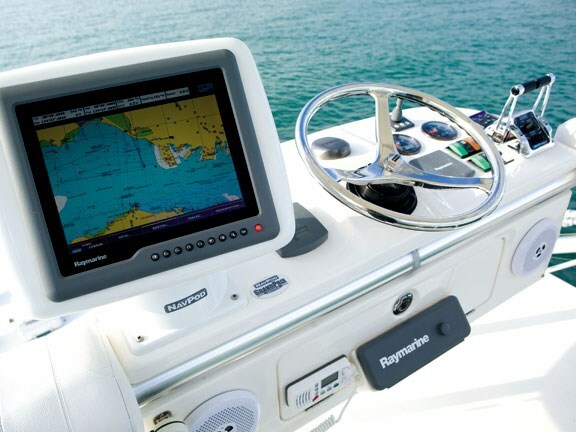 The dash is dominated by the latest and most advanced Raymarine equipment. Multiple G-150 and G-120 displays are serviced by three GPM400 processors. Data from onboard, around, and under the vessel can be displayed simultaneously night or day (thanks to a FLIR thermal vision camera). 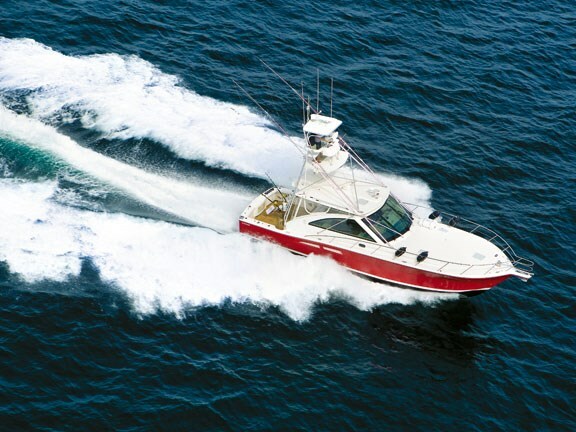 The Furuno CH300 Searchlight sonar gives the captain an edge over the competition. Twin ladder-back platinum Pompanette helm chairs seat the captain and mate. White leather couches surround a table in one direction and a back-to-back full-length lounger facing aft. The polished timber, granite and soft furnishings are straight from the Riviera luxury template. All the fittings are quality and robust, with splash grooves cut into the bench tops, rails fixed around most of the flat surfaces, and double lock catches on all of the cupboards. 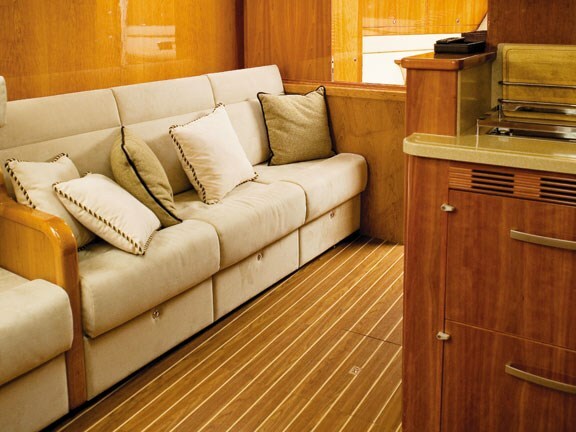 There is a queen-sized stateroom and en suite forward, and four single berths amidships that can convert to couches. A separate head services the galley and crew area. The galley is large enough to cater to any hungry complement and there is refrigeration to burn. Storage is literally everywhere you look, including at least one full-length custom rod locker. 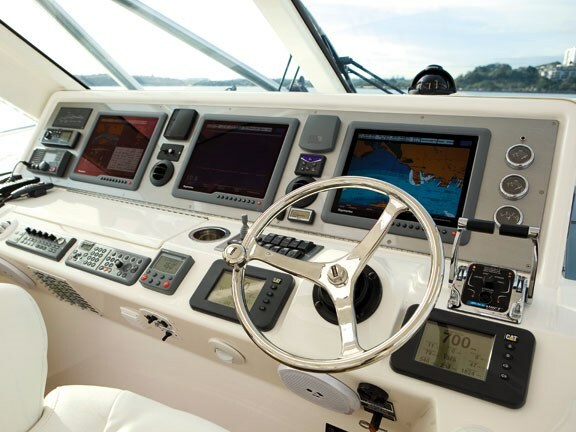 The low profile lines of this vessel and the almost full-width aft-facing couch presents a few engine room access challenges as there is no space for the usual sealed engine room door found in the flybridge models. Instead, inspection access is via a hydralic ram, which lifts a central section of the aft couch. More significant access is by means of electric rams under the saloon floor. The entire saloon floor lifts up, providing full headroom and excellent ventilation. 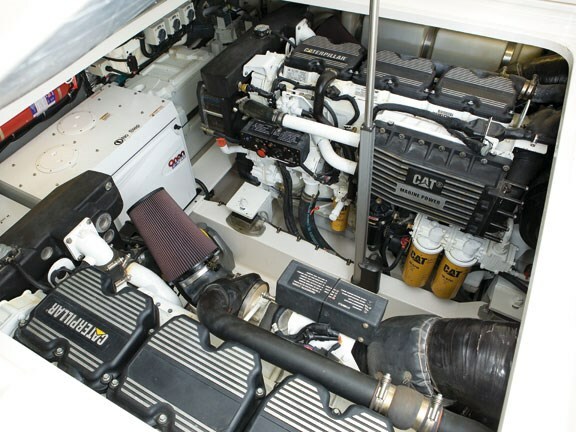 As well as the twin C18 Caterpillars, Freelance’s engine-room houses an Onan 13.5KVA generator, a HRO 900 "gallons per day" watermaker, a 2.2kW inverter, and several other items of hardware. 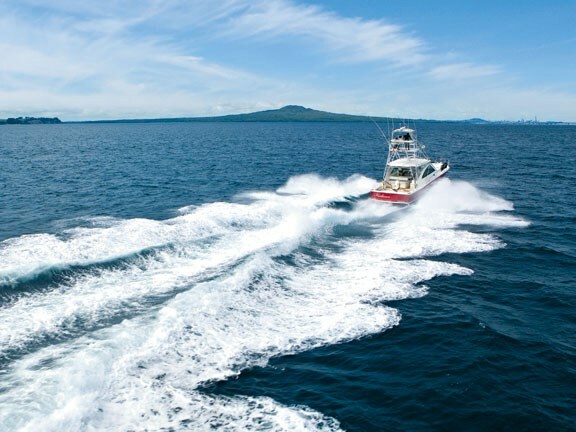 The Freelance can undertake the blue-water crossing to Fiji, and then more than capable of crossing to and fishing any of the South Pacific islands. Several modifications have been carried out to make this possible. The most important is the increase on the standard fuel carrying capacity of 3500L to 5500L. 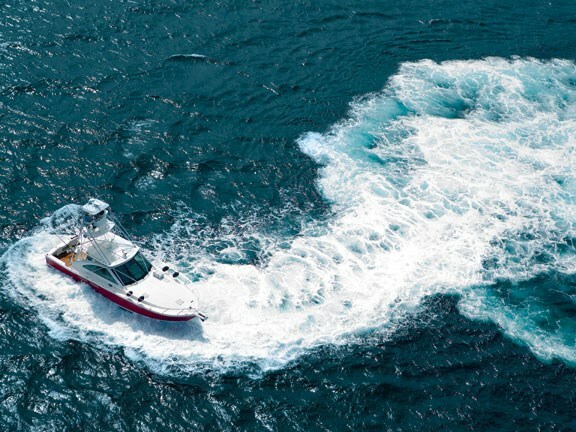 Others include the addition of the KVH satellite phone, the Furuno 408 weather fax, the Zodiac six-man life raft SOLAS pack and all of the Cat 6 equipment. The custom stainless tuna tower offers great visibility. Padded cockpit sides protect the wireman and provide a place to wedge your knees. 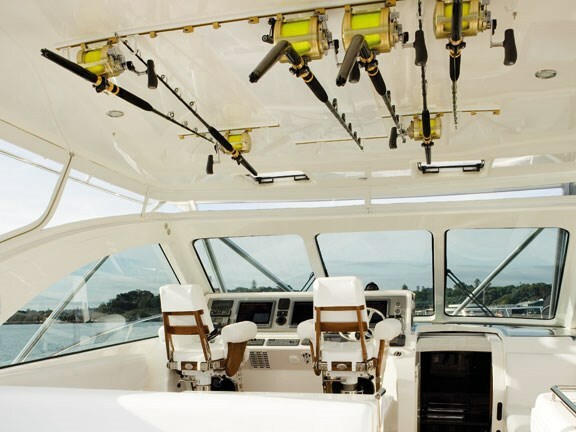 The gunnels and transom are clear of line-catching obstructions and well placed clamps keep all the necessary tools within reach. 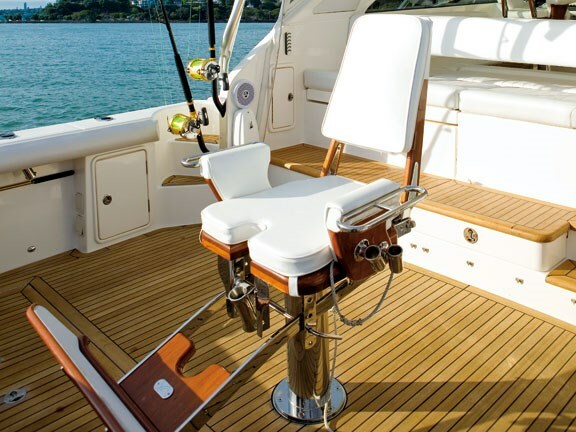 In the centre of the cockpit is an Alltackle USA Unlimited fighting chair set on reinforced plates to handle 130-pound tackle. It’s a quality chair finished in varnished timber. Heavy duty rod holders in the gunnels are a necessary complement. A sensible addition to the cockpit is the custom-built stainless rod holders located in the side walls of the saloon. Their primary task is to provide an easy storage location for the spare heavy tackle rods after a hookup. They are a great way to protect the equipment and boat from damage. The custom tackle locker is impressive. 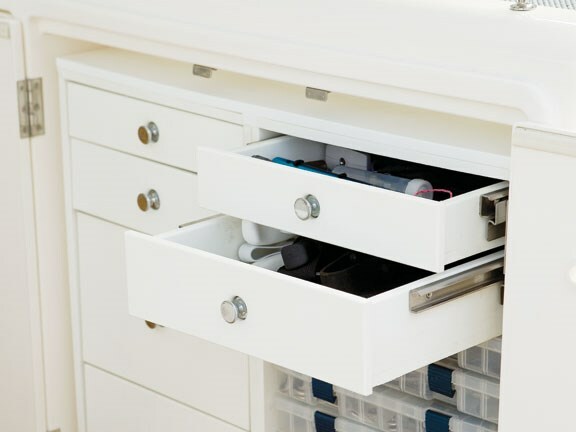 The easy access storage ensures every tool has its place and is simple to locate in a hurry. The preparation bench is a good size, although a removeable rigging station with a built-in cutting board adjacent to a wash-down hose would be a sensible addition. From a live-bait point of view this boat has all the bases covered. A huge well with a window is central to the transom. The custom stainless tuna tubes are as good as I have seen. 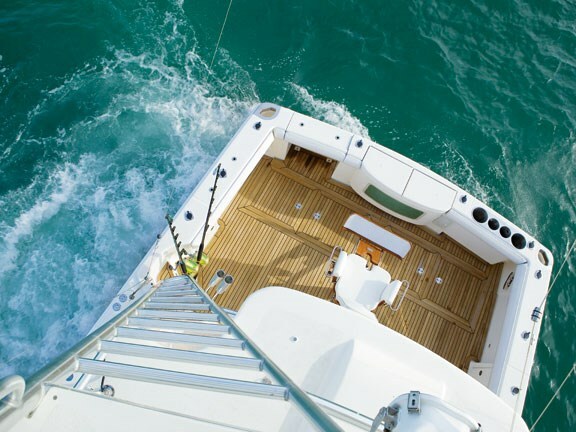 Four tubes in two sizes are fed by a high volume pump with the aid of hull scoops that are efficient enough to allow the pump to be switched off when the boat is running. This is one quick boat in a straight line. The twin 1018 horsepower C18 Caterpillars coupled to Twin Disc’s awesome gearbox via the almost bulletproof electronic control system deliver fiery performance. Cruise speed, which is rated at 80 percent engine load, is 30 knots with a maximum speed of 37.6 knots. That means the Freelance can happily sit on 30 knots all day. She is quick and dry in a straight line backwards, and when you spin her around she throws you off your feet. That is the sort of response required to keep you in the game against the angriest fish. The cavitation that is often present when throwing a boat around backwards was minimal and I thought the Quick Shift controls delivered reasonably delay free gear changes. The fastest we managed to get the Freelance moving in reverse was 12.6 knots but I am sure there was more available. 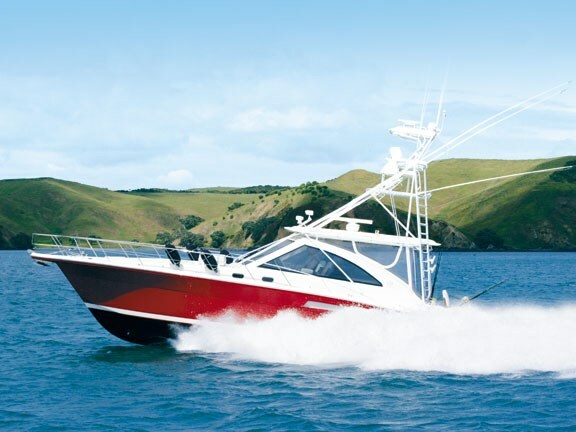 This Riviera 48 Offshore Express looks stunning and performs like a Porsche 911 set up to go hunting elephants. It’s a boy’s boat in most respects with an ability to wander the Pacific almost at will in search of the gamefish mother-load. The Freelance comes as close as I have ever experienced to the boat I would buy with an open cheque book. 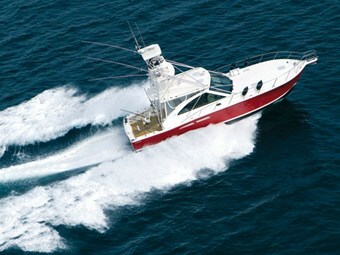 See Riviera boats for sale.